Since its inception, VirtualCards has been designed to bring benefits to those who use it, keeping pace with the technology that evolves on a daily basis. The VirtualCards team values simplicity and organization; moreover, it appreciates the winnings of the users of the app. That's precisely why we've put together for you a list of the benefits of the app that retrospects the achievements over time. Are you ready to see what benefits you will have? 1.Through VirtualCards, the plastic card becomes a virtual card. 2.Through VirtualCards flyers become offers on the phone. This measure is beneficial to the environment, as paper is no longer scattered on leaflets or flyers. Protecting the environment is a constant concern for the VirtualCards team and we hope that you will join us in this approach. Whether you are passionate about electronics, clothes or furniture, the VirtualCards application will always inform you about new offers, promotions or discounts. This will be done very simple by some notifications from the app, where you will be informed by a short message about commercial news. For this, all you have to do is to have the option to receive notifications from merchants enabled. With VirtualCards, you'll be a step closer to your favorite merchants! If you add or generate a card to a merchant, you can send a feedback to share your shopping experience or tell them which were the most attractive offers. At the same time, if you encounter certain problems, the dedicated team behind the application will help you to solve any possible situation. At VirtualCards, we encourage dialogue and we are always focused on results. By doing so, we want to thank our users and partners for their constant support for the application. 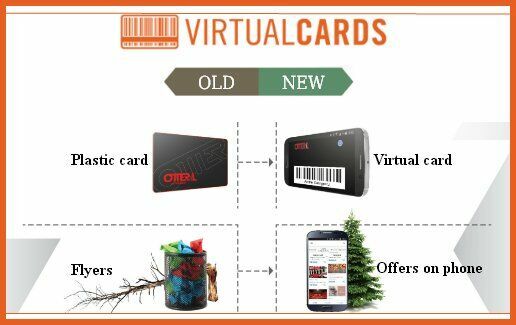 We hope to expand in the shortest time in the international environment so you can enjoy as much of every benefit as possible and remember that we always stay at contact@virtualcardsapp.com. With VirtualCards, shopping is always more enjoyable and easier!